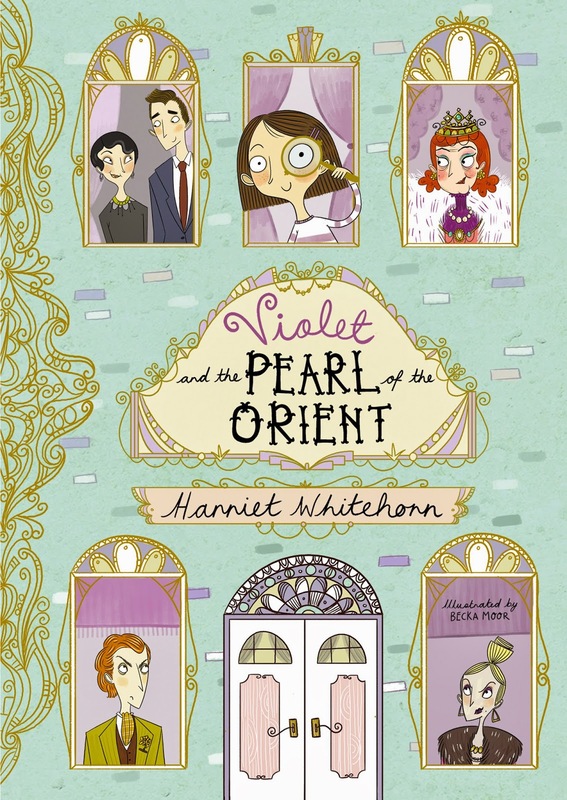 One of my favourite recent reads was the wonderful Violet and the Pearl of the Orient, written by Harriet Whitehorn and illustrated by Becka Moor! I was thrilled to get the chance to interview BOTH of them, and am delighted to be kicking off the blog tour here! I’d love to say an equal mix of girls and boys but I think realistically my readers will mostly be girls, although a boy named Art does join Violet and Rose on their adventures in Book 2, so maybe I can lure a few boy readers in then. I am hoping to appeal to a broad mix of girls as Rose is quite girly but Violet herself is quite a tomboy. I’d also like to think that it will be a book that parents will read aloud to their children, and there are some jokes in there that might make them laugh. 2. I was hooked from the introduction of the characters with the brilliant two-page spread showing them and telling us their favourite foods – what gave you the idea for this? The character of Dee Dee came to me pretty much fully formed and one of her traits was that she didn’t eat proper meals; she lived off cake and banana sandwiches and gin probably (but I left out the last bit as it was a children’s book!). And so the idea really expanded from there. 3. And on that note, what’s YOUR favourite food? I do eat scary amounts of chocolate but, like Camille, my favourite food is steak and chips. 4. Did you have a mental picture of Violet and the other characters when you started writing about them? If so, how close were Becka’s drawing to how you imagined them? Yes I have strong mental pictures of almost all the characters, and Violet is small, feisty, slightly St Trinian's like girl with a big can-do attitude and I think Becka has caught that totally. And she has done a marvellous job too with the other characters - I particularly like the Count and Countess Du Plicitous. 5. 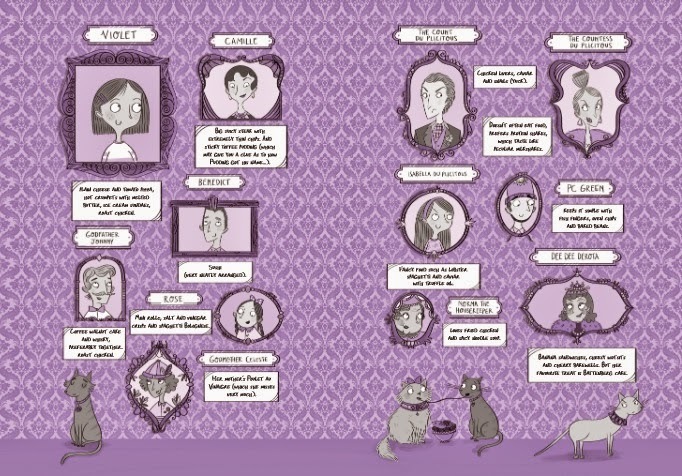 I really liked the glossary – particularly as there are some challenging words for the target audience in the book! Do you think authors of books for younger children have a responsibility to try and stretch their vocabulary? Yes I do. I try to include just a few difficult words to stretch the reader a little bit, but not enough to put them off, I hope. 6. What’s next for Harriet Whitehorn? Well, the next Violet book is out in March, then the third one is out next August, so I imagine I’ll be pretty busy with them. But in between, I am very slowly writing a book for older children - ten to twelve year olds - which I can best describe as Game of Thrones meets Eva Ibbotson! We’ll see how it turns out. 1. How much guidance do you get from authors or publishers when you’re illustrating a book? I think it really depends. 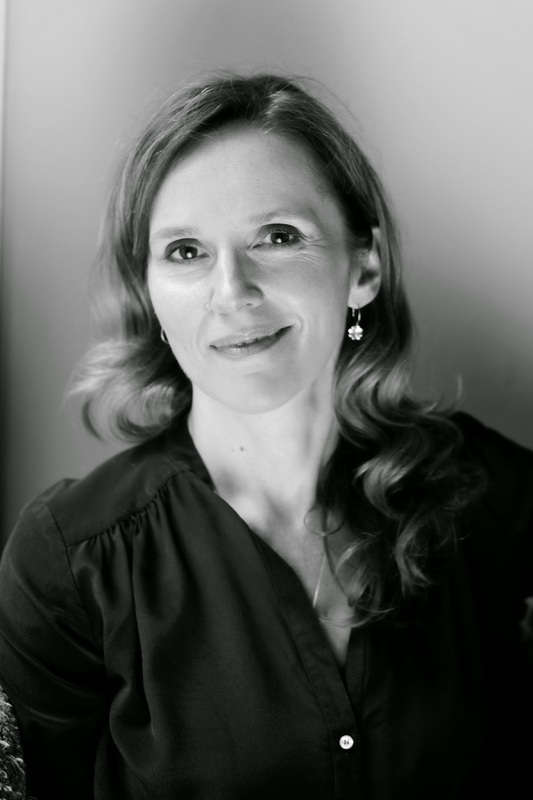 With ‘Violet’ I was given specific character notes by the author, which really helped me to visualise the world she had penned and get to grips with the different personalities of the characters beforehand. It has been a similar case with other publishers and authors as well. I really enjoy the collaborative, all-hands-on-deck aspect when working on a book. Guidance comes from all different directions, which allows me as an illustrator to take a step back and see the book from a point of view I may not have considered on my own, which is invaluable. 2. What was your favourite picture to draw in Violet and the Pearl of the Orient? Ooh, this is a tough one. I think it’s a toss-up between Dee Dee and Lullabelle the cat lounging on the very posh chaise longue and wearing face masks and the portraits page at the beginning of the book. Although, now I’m thinking about it, I really loved working on the illustration of Violet swinging upside down from the tree as this is the first image I sketched before starting work on the project. I’m not very good at making decisions, can I have all three please? 3. Your website mentions your book idea for the fabulous-looking Foxtrot, written and illustrated by you. If you’re illustrating your own work, is there a difference in the way you approach it compared to if you’re illustrating work by another author? I think there is in the sense that I have a firmer image in my mind of how I want certain things to look, because I have already hashed out the character designs in my head when writing the story. When working with another author, it’s exciting to receive the manuscript and discover a new story and it also presents new challenges. Like drawing a field filled with horses, each in a different pose. At least with my own stories, I can choose to not include certain difficult-to-draw objects. But where’s the fun in that? 4. While you now live in Manchester, you got your degree from Glyndwr University in my hometown of Wrexham. Is there anything you miss about studying in North Wales? I miss that, despite being only an hour down the road, the bus system is completely different. I also miss the stunning St Giles' Church building, which reminded me of something out of the Lord of the Rings. And the giant Wilkinsons. 5. 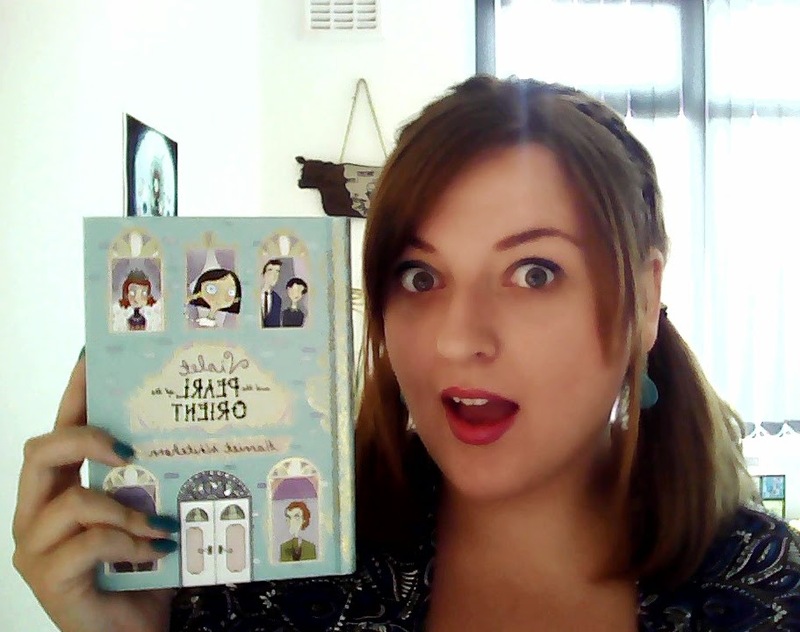 I'm really looking forward to seeing Violet hit the shelves so people can love it as much as I do, but I'm also really excited that you’re working with another author I really love, Clementine Beauvais, on The Royal Babysitters, which is coming from Bloomsbury next month. What can we expect from the series? You can expect adventure, laughter and madness on a super grand (and slightly insane) scale, led by two sisters, Holly and Anna Burnbright, and the ice-cream obsessed Prince Pepino. It is going to be a really fun series that I think children (and their oldies) will absolutely love. 6. What’s next for Becka Moor? What’s next is Violet book number two! I have already begun working on the cover for it. After that, I will be working on a couple of new young fiction series, a picture book or two and I will also be working on my own young fiction story that I started writing not too long ago. There are no horses in the foreseeable future. Don't miss the rest of the tour, which has some of my favourite blogs on! See the banner on the right for details.